An elegant box with 4 envelopes of 80 grams full of flavour and passion. In the recommended box of Iberian products, you will find chorizo, salchichon, lomo and obviously Jamón all products 100% of Iberian Bellota-acorn selected from different origins so that you enjoy them at the best dry-curing time. This pack, ideal for original gifts, does not have a pre-established format, the origins of the Iberian products can vary depending on the ideal dry-curing of the product, that is, a pack can contain Iberian dry-cured sausages from Huelva and Salamanca along with a Jamón from Cáceres / Badajoz, for example. One thing is really always the same: you will enjoy the selection of Enrique Tomás products as never before you were able to with this type of products. Let the flavours that we have carefully chosen for you take over your palate. Jamón is a flagship product of Spanish gastronomy and Enrique Tomás has set himself the task of giving it a name so that it can be recognized by its true name Jamón, as what it is, a unique delicacy in the world. The products contained in the recommended box of Iberian products have been made from 100% acorn-fed Iberian pigs, that is to say, the animals have eaten acorns in freedom and their meat has these delicious and characteristic white streaks, fat infiltrated naturally directly into the muscle, an exclusive condition of this type of pig. On the one hand, we have sausages, a product that is always welcome and can be eaten as an appetizer, in a great sandwich or even incorporated into traditional dishes and in this pack, you will find our best sliced products in an elegant and convenient format. As for the jamón, we assure you that you have tasted nothing better and that each slice of this jamón bellota 100% Iberico will be worth the wait. The best thing about the new recommended box of Iberian products is that its delicate presentation makes it an ideal, original and, above all, delicious gift. If you want to surprise and give something to be remembered for a long time, do not hesitate to offer one of our packs because to find yourself with the best jamón in the world and 100% acorn-fed Iberian sausages is always a joy. With this tasting you are sure to succeed and if you don't want to give it away, you better buy one for yourself and enjoy each bite slowly to appreciate the nuances and each of the exquisite flavors of the Enrique Tomás products. The box of Iberian products is more than a personal recommendation, it is a selection made from the love and confidence that you are getting the best of our products. The Jamón Ibérico from Salamanca has a totally different taste to the Jamón from Huelva, but to be able to distinguish them you have to get to know them better, and there is no better way to do it than tasting them all at the same time with some of the savings packs that we have at Enrique Tomás! Box tasting of Jamón de Belllota or the Excellence of Jamón de Bellota. These packs are made up of sliced products from the four Iberian origins and are perfect for you to try one slice of ham after another, so you can immediately notice the nuances between the different origins. The Book of experience. 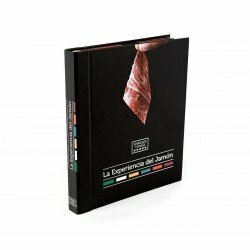 This book is the same as the previous packs, that is, it also allows you to taste the different types of Jamón according to their origin. But what's so special about it? Well, it's the only book in the world you can eat! Box Bellota 100% Iberian (flavors of). With the previous packs we offer you the possibility to taste the jamón of the different variants and with these you have another option, to taste all the flavours of the same origin, that is to say, in a single pack you have chorizo, salchichón, lomo and Jamón from Salamanca, Huelva, Cordoba or Caceres/Badajoz. Travel pack or pack Don´t hurt yourself. The travel packs are very original packages that we have in two sizes, 1.8 kg. or 3kg. The small package consists of 18 sliced sachets, two sachets of cubes, two sachets of ham shavings and one vacuum-packed with the ham bones, while the large one contains, instead of 18 sachets, 33 vacuum-packed sliced sachets together with the rest of the products. These packages are perfect to give to friends or family because they have a very original presentation, they are small travel bags. Saving packs. Are you looking for something more complete as a Christmas humper? Well, Enrique Tomás we have it too. Thanks to our savings packs you will find in a single package jamón, wine and “Sevillian picos”.